Photo Snap will Find, Display, Edit, Print, Organize, and E-Mail Images and Pictures. You can also find and play multimedia files, including Audio Video and MP3 files. A Slide Show is included that provides you with hundreds of transitional effects between picture viewing, and plays MIDI or MP3 music in the background. You can cut and paste sections of a picture into another picture, add any amount of text to the image or picture using numerous fonts and colors, and draw or add shapes to the picture using millions of colors. These techniques can be used to make greeting cards for any occasion, and can be E-Mailed over the internet. Pictures can be printed on a sheet of paper with labeling for each picture using an unique font and label color. All the usual editing features are available such as contrast, brightness, Color Hue and saturation, flip, rotate, invert, zoom, stretch, resize, with special effects as mosaic, posterize, and sharpen to name a few. 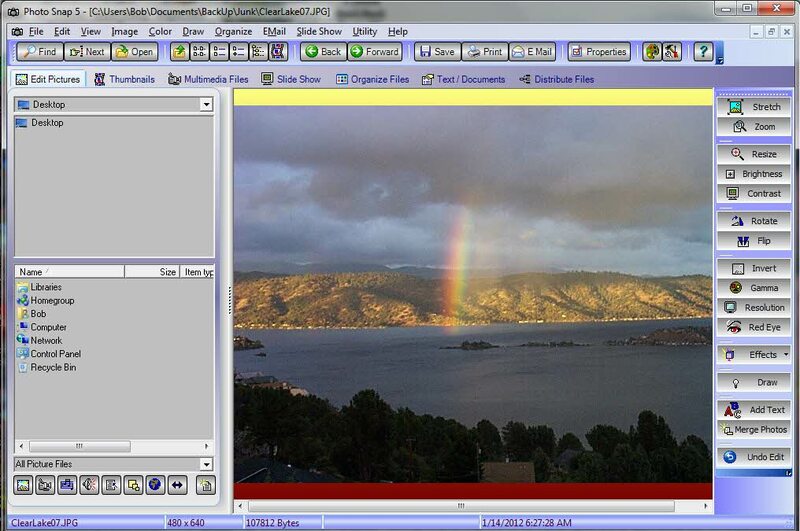 The Microsoft Window Media Player Component is part of the program, so you can play Audiovideo, MP3, and other files supported Windows Media Player. Lists can be made of folders containing different types and categories of files that are quickly located with the click of a button. The program starting point is a Device/Folder/File Explorer that may be resized or hidden with Picture Thumbnails displayed. Pictures are viewed just by clicking on the File Name. Using the menu Open File option will display a file, and is useful to open files over the network. File operations as Move, Rename, Delete, and Save are available. You may convert between the major image file types. Batch Rename, Copy and Convert is also available. Zip and UnZip Files.